Global welding company Fronius has recently launched completely digitised, microprocessor-controlled TransSteel 3500 and TransSteel 5000 inverter power sources. Designed for use in harsh environments for steel welding applications, the new welding systems offer superior functionality, energy efficiency, mobility and reliability. Dave Smith, Manager SMENCO, Australian distributors for Fronius says that their MIG/MAG and MMA welding customers will soon see the benefits of features such as intuitively controlled functions, innovative wire-feed, ergonomically designed torch and a robust design. 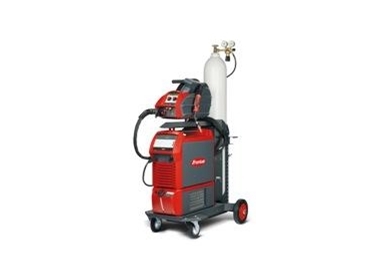 Describing these new portable steel welding systems as comprehensive ‘steel transfer technology’, Fronius says the innovative wire-fed lightweight, 350 and 500 amp systems are powerful as well as efficient, offering superior performance in harsh operating conditions either in the factory or onsite. Designed for welding professionals in mechanical and steel engineering, pipeline, crane, rolling stock and container construction, shipyards as well as various steel-processing industries, the new TransSteel weld systems deliver perfect weld properties when joining heavy steel components. Fronius welding equipment is distributed in Australia by SMENCO .